We are a factory authorized SunTek dealer and installer offering the best window film in the industry…We exclusively sell and install SunTek Carbon XP window tint that offers our customers a no fade nationwide lifetime warranty with no signal interference…it simply does not get any better than that! SunTek Carbon XP (CXP) is a premium automotive window film manufactured with the latest Nano-Hybrid technology including non-metal, no fade, carbon constructed providing you with significant solar heat rejection within the window film industry backed with a manufacturers nationwide lifetime warranty. SunTek Carbon XP window tint properties . . .
All window tint films reject 99% harmful ultra violet sunrays. The window tint manufacturing process . . .
SunTek window tint is made in Martinsville, VA which we have found to be the most technologically advanced window film manufacturing facility in the world with superior customer service. SunTek manufactures the best performing, longest lasting window tint for our extremely hot and sun drenched climate here in the Arizona desert. Carbon is manufactured to be a non-metal window tint film designed for use in today’s vehicles with sensitive electronic antennas built into the glass. Such as the back windows of most highline vehicles, you simply do not want a product with metal in it up against the sensitive antennas as this can cause extreme interference leading to interrupted vehicle operation. Carbon window tint is the only effective solution to this common problem. Another excellent remedy to protect yourself and your vehicle against the harsh Arizona sunshine is with Carbon XP window tint. Harmful ultraviolet light can have a tremendous effect on your skin, even from just exposure while driving. Carbon XP window tint rejects 99% of dangerous ultraviolet light from your vehicle windows helping to keep your skin safe. This will also better protect your interior from U.V. sunrays and heat damage. With SunTek’s nationwide lifetime warranty against fading, your investment in Carbon XP window tint is fully protected as well. Safety and Security Benefits . . .
As a safety improvement to your vehicle, SunTek window tint helps keep broken glass intact once shattered. This means that it is less likely to become air born and fly into your vehicle in the event of an accident. As a security advantage, SunTek window tint helps keep unwanted individuals from seeing into your vehicle while driving down the roadways as well as when your vehicle is parked unattended. Choose from various shades of protection at no additional up charge. Many shops throughout the valley charge more for darker tints. All guaranteed price quotes are for the entire window tint application start to finish, you can choosing any shade within Arizona state law requirements at no additional fee. Care and Maintenance . . .
To extend the life and looks of your SunTek Carbon XP window tint and to maintain your lifetime nationwide warranty, certain care and maintenance procedures should be followed. Do not roll down your windows after the window tint application has been completed for 5 days. This allows the window tint to properly adhere to the glass. Do not wash the window tint for 30 days after the initial installation has been completed. You can wash the exterior of your vehicle right away as all window tint is applied to the inside of your vehicle glass. Use a mild soap solution and a clean soft cloth or synthetic sponge on your window tint. Avoid ammonia window cleaners permanently. Do not use abrasive cleaners or coarse clothes on your window tint. Always clean the inside of your vehicle windows, then the outside. This can prevent unwanted road debris from being tracked into your vehicle possibly damaging your window tint. The recent development of nano-hybrid technology within the window film industry has allowed SunTek to develop and manufacture Carbon XP window tint. It is produced using multilayered nano-technology with hundreds of micro layers of polymer and uses no metal during the window tint construction process. The direct benefit of this technology is to block the infrared (i.e. heat) portion of the solar spectrum. This gives the consumer the ultimate performance, safety and health benefits of the older metalized window film technology without its major drawbacks. This same advanced nano-hybrid technology is used to improve the brightness of flat panel LCD televisions. The latest in non-metal, nano-hybrid, Carbon technology. Non-reflective Black finish that will not fade, bubble, peel or delaminate. Superior solar performance, including advanced heat, infrared and U.V.L. rejections for increased vehicle comfort. Exceptional optical clarity with a variety of shades that match factory tint and enhance the look of any vehicle. No metal layers…Signal enabling technology that causes no interference with AM/FM or satellite radio signals, Bluetooth / cell phones, garage door openers, BMW Assist, Mercedes-Benz Tele-Aid, OnStar, navigation GPS systems, radar or other high frequency signals that may be installed on your vehicle. Lifetime Manufacturer’s nationwide materials and labor warranty, that includes fading. Suntek Window Tint WarrantySunTek window tint lifetime warranty registration . . .
For your convenience as our valued customer, we register all vehicle window tint applications directly with the manufacturer SunTek to ensure that your lifetime purchase is validated at time of installation. We remove the hassle, inconvenience and worries about any concern that may arise for you down the road. Have you recently relocated to sunny Arizona and have a warranty related concern with your SunTek window tint? We are a fully authorized SunTek dealer and can assist you in correcting any warranty related issues and file a warranty claim on your behalf to remedy your vehicle window tint concerns. This is all done at no cost to you as all of our SunTek window tint customers nationwide have a manufacturer backed lifetime warranty that includes materials and labor for any valid warranty claim submission. 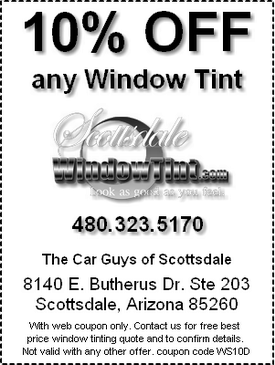 Scottsdale Window Tint at 480.323.5170 and let us help you address and correct any window tint concerns. SunTek Carbon XP window tint puts you out on the road in style! Suntek Window Tinting Information and Warranty. Carbon XP window tint is designed to make you look hot while you stay cool!